Stefanie Wernisch, Ph.D., nabbed a job at Waters Corporation, a leading global specialty measurement company in Germany, after joining U-M’s Biotech Career Exploration Program. Sometimes big opportunities arise from places you least expect. Just ask Stefanie Wernisch, Ph.D., 34, a former research fellow in the Department of Internal Medicine at the University of Michigan who nabbed a job at a leading global specialty measurement company in Germany after joining the university’s Biotech Career Exploration Program. What’s interesting is that science wasn’t even on her radar in high school— Stefanie studied literature and languages. But as a first-generation student in her family, the native of Lienz, Austria switched gears to chemistry, a subject that had better employment prospects, she said. And although she struggled her first few years and thought about giving up, Stefanie realized that her understanding of the chemistry concepts had deepened. “I started really enjoying learning more and more about how things worked and how the different subjects—physical chemistry, analytical chemistry, and math— were connected,” she said. This growing interest spurred reading outside of the required texts for classes, which improved her grades and helped her get accepted into a group led by the prolific scientist and professor, Wolfgang Lindner, Ph.D., in the Department of Analytical Chemistry at the University of Vienna, Austria. There, she was able to do work for her master’s thesis. 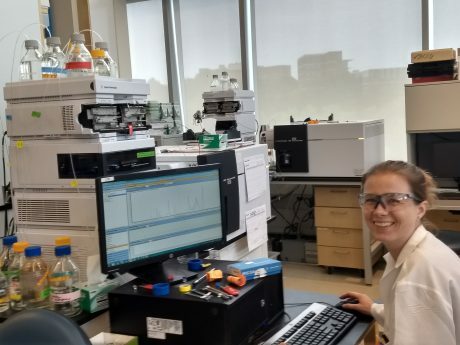 “I learned so much about chromatography and separation science in these six months that I asked my professor to let me pursue a Ph.D. in this group,” Stefanie said. Just before completing her degree, working on synthesizing stationary phases— materials whose surface has been modified so they can recognize and selectively hold on to specific, complementary molecules— she moved to the United States, working at the University of Texas at Arlington as a visiting scientist. Upon finishing her Ph.D., she joined Indiana University as a postdoctoral fellow and later moved north to the University of Michigan as a research fellow studying metabolic biomarkers of chronic kidney disease. 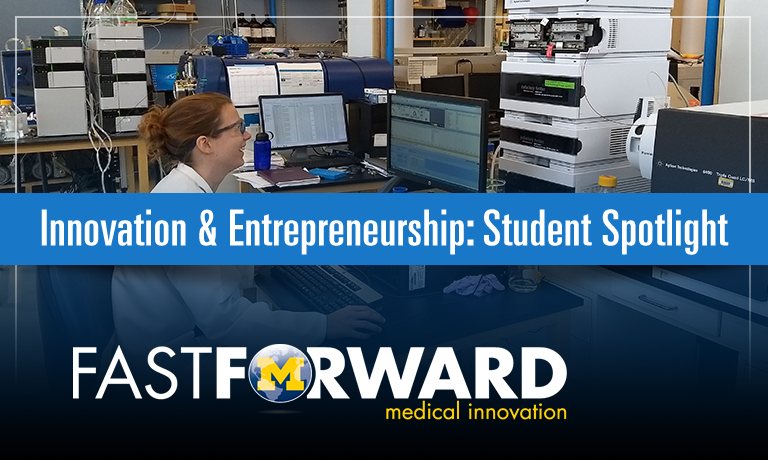 During her time at U-M, she joined the Biotech Career Exploration Program, a structured curriculum provided by Fast Forward Medical Innovation, the Michigan Institute for Clinical & Health Research and the U-M Medical School Office of Graduate and Postdoctoral Studies, that provides career exposure to various aspects of biotechnology outside of the traditional academic tenure-track faculty positions. She said the program came at a perfect time for her. “Having a structured program with clear goals and deadlines streamlined my job searching efforts and pushed me to reach out to strangers to learn about their career paths,” Stefanie said. In fact, it was one of these conversations that directly led her to getting a job offer in southern Germany at Waters Corporation, one of the world’s leading manufacturers of chromatography and mass spectrometry instrumentation. After being accepted into the program, she was introduced to the director of the clinical lab at the U-M Hospital when taking a tour, someone who specialized in mass spectrometry and had a passion for instrumental development—just like Stefanie. It turned out her background in separation science, mass spectrometry, and clinical research and interest in the business side were a perfect match. In the position, Stefanie will be involved in clinical business development, responsible for communicating the value of the company’s product portfolio to key opinion leaders and customers in clinical research, diagnostics, and forensics. She said that these fields face a lot of challenges, including the need for specific and accurate measurements, so appropriate clinical or legal decisions are made.